The University of Utah Utes (11-8, 5-2 Pac-12) visited the University of California Golden Bears (5-15, 0-8 Pac-12) as they won, 82-64. The Golden Bears had something to prove as they came in to the game looking to snap a three-game losing streak. “Before the game I said, let’s focus on 20 minutes and we regroup,” California coach Wyking Jones said. From tip-off, the Bears played with intention. Freshman forward Andre Kelly was the catalyst. Grabbing rebounds on both ends, switching on picks and finishing tough layups in the paint. 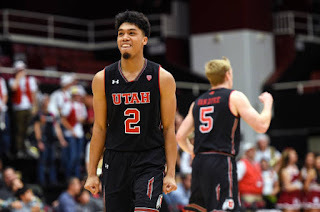 The Utes countered the Bears attack with precision and consistency on their three-pointers. The Utes started the game shooting 8-of-15 from behind the arc. Senior guard Sederick Barefield was 50 percent on three-pointers and led the Utes in scoring with 11 first half points. The Utes went on a streak with seven consecutive shots, which pushed their lead to 14 points. They pulled away to a 41-27 lead over the Bears with 6:20 remaining in the half. California fought back with sharp long-range shooting from Freshman guard Matt Bradley and Sophomore guard Darius McNeil. These shots cut into the margin, but the Utes led 46-42 at the end of the first half. The second half started similar to the first half for the Bears. Getting the ball to their 6-foot-8 forward Kelly. Junior guard Paris Austin threw a perfect alley-oop pass to Kelly in the lane. Utah continued its first half strategy as well. The Utes grew their lead to 14 points again. Barefield added 10 points in the second half and finished the game leading all scorers with 21. Junior forward Jayce Johnson shot an impressive 3-of-3 from the field. Making layups seemingly at will. The space for Johnson was created by freshman forward Timmy Allen, who led the team in assists. Allen also added 17 points in the game. The Utes finished the game shooting 66 percent from the field but also a 42 percent on three-pointers. This was a true indicator for the outcome of the game.